In arguably one of his best roles, the late Robin Williams portrays Patch Adams, a man who decided to make his life about helping others. Adams believes that patients need to be treated not just for their physical ailments, but also for their emotional well being. He also believes that like freedom of speech, healthcare is an inalienable human right that should be provided to everyone. This is a film that was written specifically for and with the help of Robin Williams. While Adams himself admitted that much of it was inaccurate, the film fulfills it's message, by using an extreme mix of emotion and humor. While watching this film you'll go between tears of laughter and tears of sadness, in a film that will really hit home with a lot of people. This is what Robin Williams was known for, he told his stories and got his messages out, while at the same time entertaining and inspiring people to be the best that they could be. 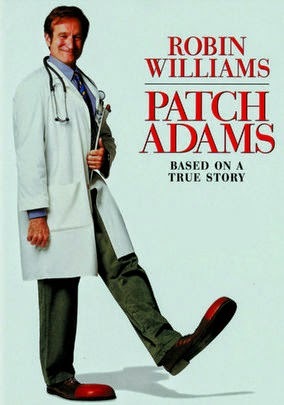 If any other actor had played Patch, it probably would have been a slow moving drama, that just made everyone sad, but Williams made the story one that made you think and it sticks with you. As it recent weeks it has come to light that Williams himself was sick, and this may be the reason he took his own life, I can't help but wonder if on that night, had he watched this film, would the outcome have been different?